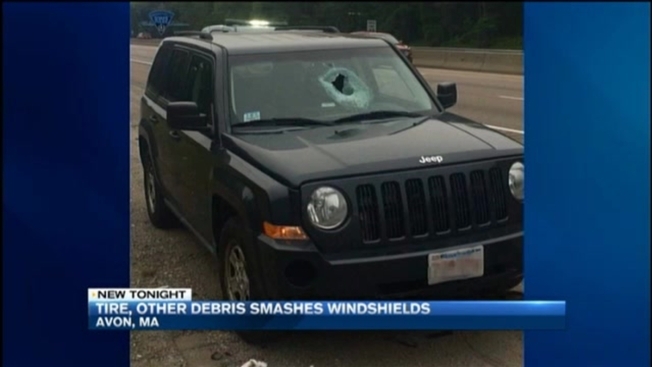 Two separate incidents that happened Sunday on the same stretch of Massachusetts highway left five people injured - one seriously. Just before 4:30 p.m., three family members were heading north in a Toyota Sienna on Route 24 in Avon when the wheel from a Ford pickup truck that was going south came up and hit the windshield. According to state police, the minivan's driver, a 45-year-old Dartmouth man, cut his head and was transported to Boston Medical Center. Avon Fire said that injury was serious but not life-threatening. The other two patients were taken to Brockton Hospital with minor injuries. The victims include a husband, a wife and a daughter, fire officials said. The truck that lost the wheel is owned by Hard Rock Concrete Construction Inc.
Just after 6 p.m., in the same location, an object hit a Toyota Camry's windshield and bounced onto the windshield of a Jeep Patriot. According to Avon Fire, that object either came off the back of a vehicle or was a piece of debris that was already in the road. Fire officials said three people were hospitalized in the second incident. However, state police later clarified that only the two drivers were hurt, and that neither of their injuries were considered life-threatening.